For some years we have supplied and shaped gritstone for various projects at the Harewood Estate, so when it was decided to build a STUPA at Harewood in 2003, we were asked to take part. 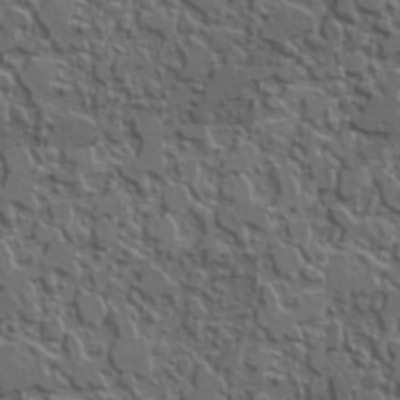 weblink - new window: What are Stupas? This was an exciting project in many ways, not least that the building of a stupa is steeped in Bhuddist tradition and holds great significance for all those involved. The very shape of a stupa is highly significant and it could not be tackled in the usual way by asking an architect to produce drawings. 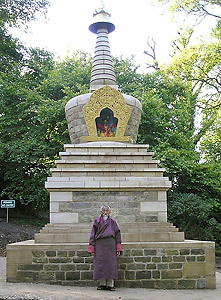 Several monks from Bhutan, including Llama Sonam (shown with Stupa), were invited to stay at Harewood to oversee the project. Llama Sonam is the most experienced stupa builder in Bhutan and is said to have built over a hundred stupas. He doesn’t speak any English, so he was assisted by Gaylong (monk) Phub Dhorji, who speaks excellent English but has no building experience. The actual shape and structure of the stupa evolved, bit by bit, at meetings over cups of Chai (tea) at Greystone Farm, where Llama Sonam would explain something to Phub Dhorji, who would, in turn, explain it to us. We would then ask questions and make sketches until we had established enough detail to keep us working until the next meeting. The meetings were always great fun and everyone who met or encountered the monks, particularly Llama Sonam, remarked on what an uplifting experience it was. The walling panels were built from stone found at Harewood and the rest of the structure was fashioned entirely from Rockend Moor Gritstone, Shaped at Rockend Moor by stonemason Peter Hird. The Stupa was assembled on site by Ian Copeland’s able team, now known as I.C. Build Ltd.
After the building was completed a ceremony was held where a team of monks chanted at the Stupa for several days. During this period, we were invited to an open day at which we were introduced to H.R.H. Prince Charles, Prince of Wales.